Did you know that you can recreated the experience of an arcade air hockey table right in your home? It’s true! The best part is that it doesn’t even matter how much room you have. 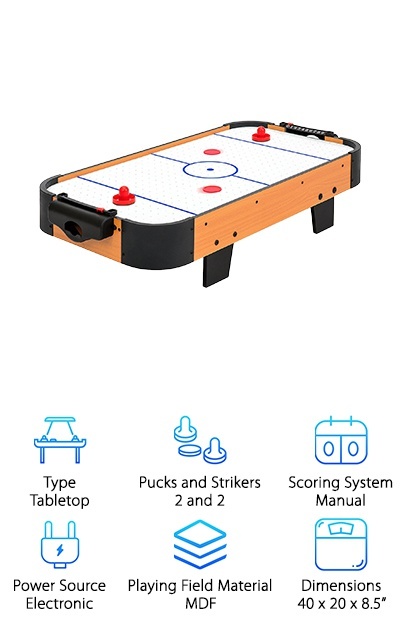 To help you find the best home air hockey table, we’ve researched a variety of different brands and styles to bring you these air hockey table reviews. Before we get to it, let’s take a closer look at some of the features you need to be familiar with. Type - There are full sized air hockey available for your home if you have the space for on. They’re pretty big, though, so if you don’t have room, there are smaller versions and even tabletop games that recreate the experience. 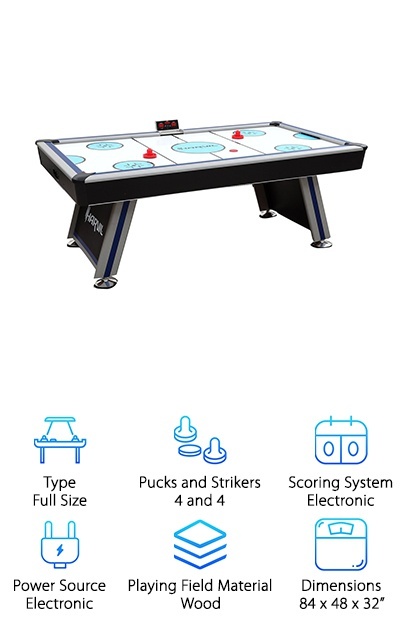 Pucks and Strikers - All of the top rated air hockey tables enough pucks and strikers included so that two people can play. Larger tables might even include enough for team play. They’ll match the scale and color scheme of the table, too. Scoring System - Some have LED scoring systems that are battery powered. Some have manual sliding systems located about each goal. Some even have both. This all boils down to personal preference and what’s available on the table you like. Power Source - Most of the best air hockey tables have fans that are powered simply by plugging the table into an outlet. Most do not have on/off switches, either. There are some mini tables that are powered by batteries, though. Playing Field Material/PFM -The playing surfaces are usually made of wood or MDF. They’re designed sort of like arcade tables - the hair small holes cut in them to the air can come through and lift the puck. Dimensions - The dimensions vary depending on what kind of table you get. Obviously, full sized tables are going to be pretty big and table top tables will be small. Just make sure it fits in whatever space you have available. Maybe you were looking at air hockey pool table combo reviews and thought, no, we don’t have room for cue sticks in our living room. 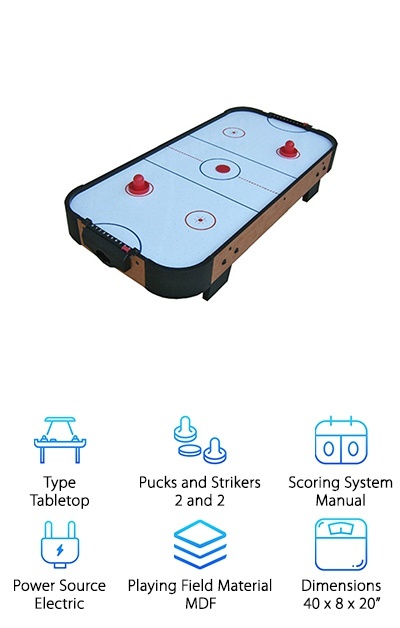 Well, air hockey is here for you. Now that you know what to look for in an air hockey table, let’s float on into our air hockey table reviews. If you’re in a hurry, check out our top and budget picks first to get an idea of what’s out there. And, with that, game on! For a full-sized arcade quality air hockey table that is packed with features and just looks really cool, check out this one from Harvil. It has a modern look to in, including bright blue and black lines and graphics and a simple, clean lined design. The legs have levelers. This is a great feature because you never really know how level your floor is until you set up an air hockey table on it. The table itself plugs right into the wall and runs on 110V of electricity. This powers the double blowers. Yes, you read that right. Double blowers to make sure you have enough air power to really enjoy the game. One more thing: the electronic scoring system will require batteries. If you’re looking for the best air hockey table for the money, this is our pick. First, it’s a budget friendly choice. This is great when you have young kids because, let’s face it, they’re going to be really hard on it and you might need to buy a second one once they’re done. This table stands only 8.5 inches high, making it a good height for kids. Just put it on a coffee tabletop and everyone can join in on the fun. It’s constructed of a durable MDF frame and has a nice looking maple exterior. One more thing: there’s a manual scoring system by each goal that’s easy to use. You’ll always know where the score stands. 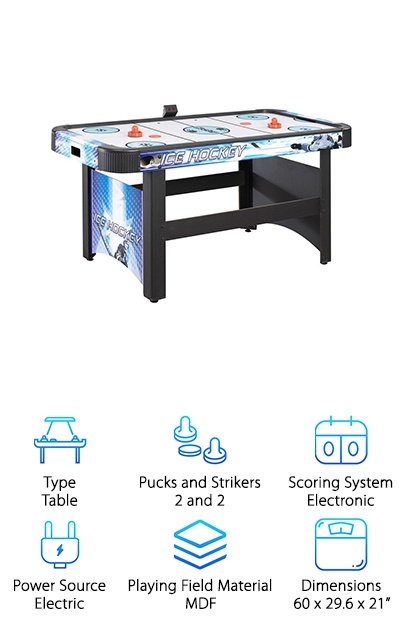 Without a doubt, this is best air hockey table for kids. Why? Well, it’s made for them. Its mini size is perfect to set up on a coffee table so your little ones will have the perfect view. None of the accessories are small enough to be choking hazards. Plus, the corners are rounded so there’s no sharp edges to worry about. Don’t worry - that’s the only place where they cut any corners! It’s constructed out of high quality hard wood. And get this: it’s powered by 3 AA batteries! So, there’s no power cord to worry about either. That’s not all. It comes with a 100% money back guarantee. That’s always nice to have, of course, but we’re pretty sure your kids will love it. This is the best tabletop air hockey game we found. Because of its size, it’s easy to transport and store when you’re not using it. Assembly is easy and fast so you’ll get be ready to play soon after you open the box. Don’t worry about your table, either. The padded feet will prevent any scratches so you can keep you focus on the game. Score keeping is easy, just slide the marker to keep track of the number of goals. It’s powered by an AC adapter so you’ll always get steady, continuous airflow during play. Another great feature is It’s made of high quality wood. It’s durable enough for places where it would get a lot of use, like a community center or an afterschool program. 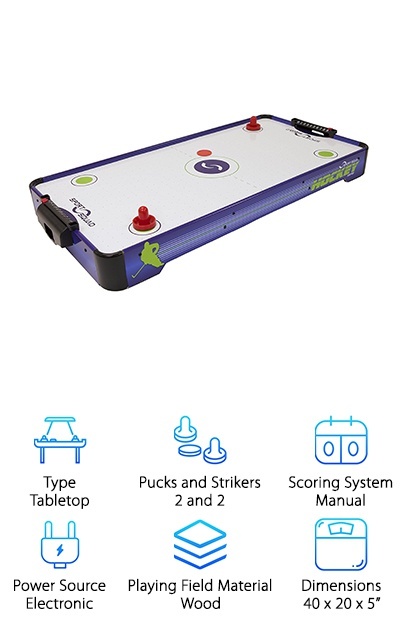 This Goplus Air Powered Hockey Table is, without a doubt, a best air hockey table for homes. It’s build with full panel leg supports so it’s nice and stable when you’re playing. Here’s something cool: there’s two ways to keep score. There’s a battery powered LED screen that keeps score but, if you run out of batteries or even if you just prefer it, there are sliding manual scorekeepers about each goal. The playing surface has a special coat that will keep the puck moving smoothly. It comes with an adapter to power the fan for steady airflow and realistic air hockey action. This table is a great size for a game room or family room and is something that family members of all ages will love. One of the great things about this air hockey table is that is has independent levelers in the legs. This is one way to make sure you always have a level playing surface. You might think your floor is level. Then you’ll turn on your air hockey table and the puck just slides down to the left hand corner every time. Simply adjust the leveler and you’ll have a fair playing surface. The legs themselves are really sturdy, too, so the table won’t wobble or sway. The design of the tabletop is really cool, too. In fact, it actually looks like it could be in an ice hockey arena. The dark blue lines and ice blue designs look awesome against the white background. Here’s another that’s in the running for best air hockey table for kids. At only 40 inches in length, it’s perfect for shorter arms. If you don’t have kids, this is also a great choice if you’re limited on space. Since it’s small, the pucks and strikers are, too. And that’s great because it means they’re perfectly suited for small hands. It’s small enough that you can put it away when your kids are done playing with it. It’s inexpensive, but don’t let that fool you. It’s built really well. The MDF frame keeps the table sturdy during play, even when it gets a little intense. And here’s a great kid-friendly feature: the corners are curved. No need to worry about anyone getting jabbed by a pointy edge during play. When we saw the name like Fire ‘n Ice, we just knew we were going to be dealing with an awesome table. We were not wrong. . Let’s deal with the boring stuff first. It features both manual and electronic scoring so you can use whichever is easiest for you. Plus, the legs are reinforced with cross braces which makes it a little more stable during play. Plus, each leg has levelers, which we know are important to make sure the playing surface it fair. Now, here’s what makes this table really special. It lights up. And we don’t just mean there’s a little light on it. It’s Red vs Blue, fire vs ice. Each corner flashes for every goals. That’s not all. The strikers and the puck light up, too! 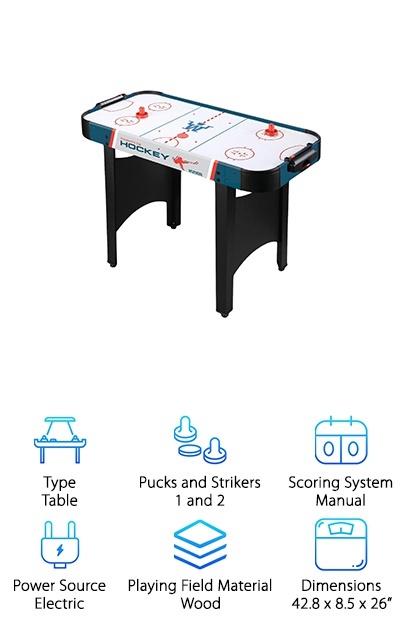 If you love air hockey but don’t have room in your home for a full-sized table, this is a great alternative. It’s compact, great for kids, and even has some cool vibrant graphics on the side for a little extra flair. It has both a manual and electronic scoring system so you can use whichever you like best. 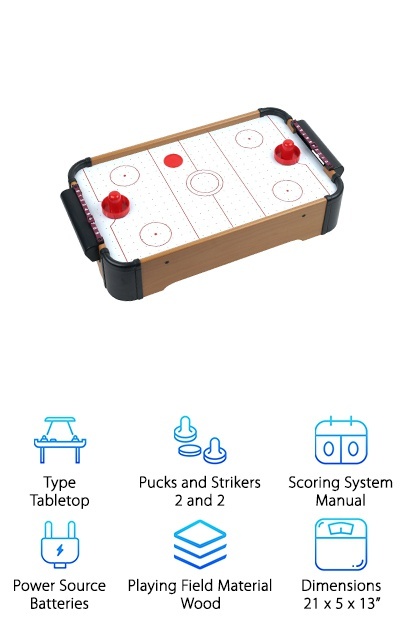 It comes complete with 2 pucks and 2 strikers. They’re bright orange and match the design of the table really well. In fact, that might be what we like the most about this one. 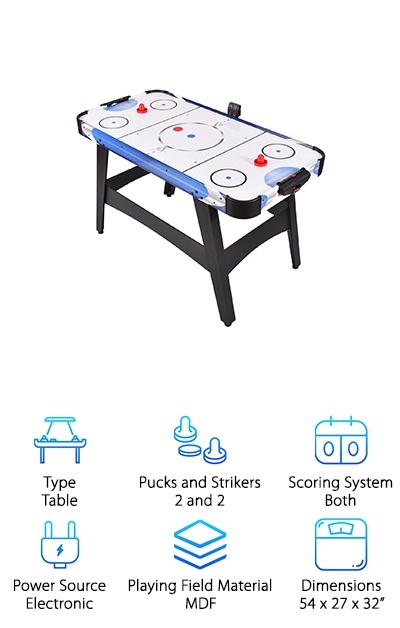 It’s the best air hockey table for home because you won’t mind having it in your living room. The design is nice to look at, the colors are great, and it’s something everyone will love. 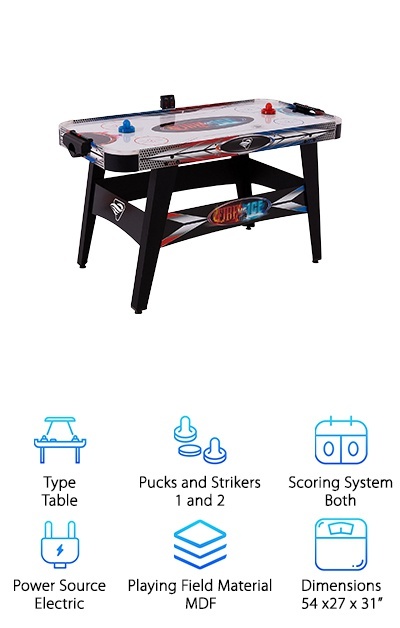 If you’re looking for another option that’s good for the kids, check out this Westminster Air Hockey table. It’s a simple design that won’t take up too much space in your living room. It’s also not so small that you won’t be able to play along. 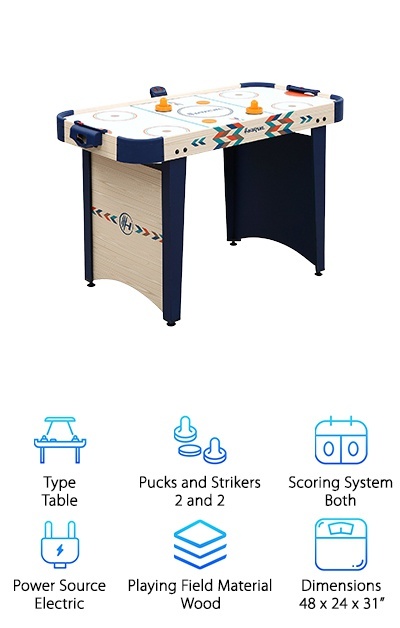 If your kids are ready for something more than a tabletop air hockey table, this is a nice step up. It will give your kids a more realistic playing experience than a tabletop game while still being a good size for them to be able to enjoy playing. The manual scorekeeping system is easy to control, too. Overall, this is a sporty looking table and the bright, playful colors only add to the fun experience.